My name is Cierra and I work in the Local History and Genealogy Department at the Kenton County Public Library. I assist patrons with finding answers about their ancestors and researching our vibrant history of Northern Kentucky. One of the parts of my job that I enjoy is assisting in the scanning, indexing, and uploading of photographs to the database Faces and Places Northern Kentucky Photographic Archive (commonly known as Faces and Places). There are so many great stories that have been uncovered and told from photographs in Faces and Places. This photograph database contains a wide range of topics covering schools, businesses, buildings, people and events. I enjoy reading the comments that are left by all of you explaining the people, places and meanings behind photographs that are unknown or unidentified. I would like to encourage everyone to leave a comment or two on the photographs in the collection. You never know—you may find a picture of yourself in our archive! You can search the Faces and Places photographs and leave comments. 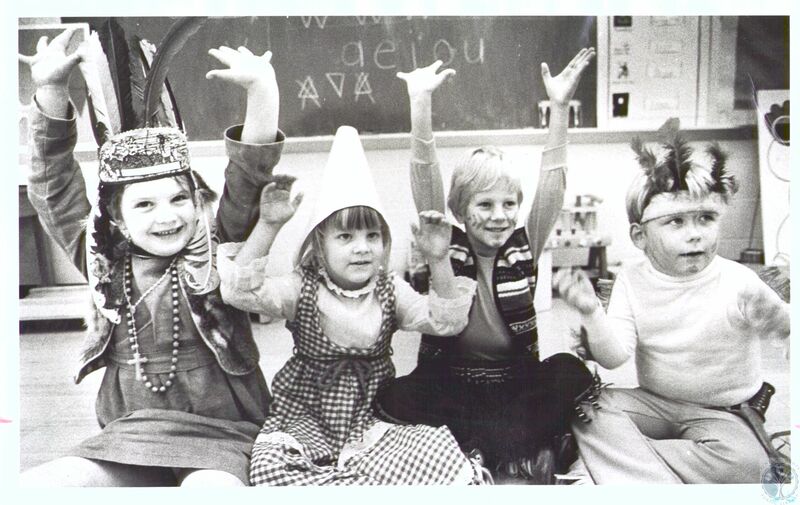 Amy Whittlesey (5), Brigette Rambo (5), Donald Powell (5), Brian Hibbler (4), at Beechwood Elementary Thanksgiving on November 24, 1977. In honor of Thanksgiving I thought I would share one of my favorite Thanksgiving related photographs from Faces and Places. You can leave a comment on the photograph. Are you friends with the Local History and Genealogy Department on Facebook? Post your favorite Faces & Places photo there.